Now weighing almost 6lbs, Tiny Kyrin Levan has been given the Ok to head home to Delaware after being born 16 weeks premature in Miami. Kim and Sean Levan decided to fly to Aruba to celebrate their first wedding anniversary. Kim was 24 weeks pregnant at the time, but had been given the OK to travel from her doctor. Four days after arriving, however, she felt her water break. When the leaking stopped the couple thought it had been only a minor incident. Two days later though, they found out that Kim’s membranes had ruptured and she was in fact in labor. She was admitted, given antibiotics and steroids and then transferred by air ambulance to Jackson Memorial Hospital in Miami the next day. “So we had this very stressed young couple who had never been to Miami in their lives and was suddenly landed over here with a premature baby,” said Dr. Shahnaz Duara. Kyrin was born on the couple’s first anniversary, weighing only 1 pound 8 ounces. He suffered breathing problems and had to be kept on oxygen for several weeks while his lungs grew. There was only a slim chance that he would survive. 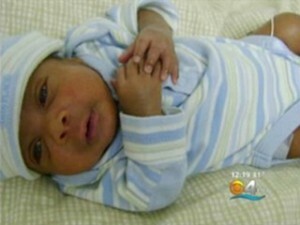 Florida Baby Arrives On A Boat – During A Storm!